Vibra Whirl installs a complete line of synthetic turf. High quality products available in varying pile heights. We provide the complete turf system, from the base work to the final grooming. Using polyethylene yarn, our synthetic turf is strong enough to withstand constant impact with low surface abrasion. This system is filled with recycled rubber granules for force reduction and improved maintenance. 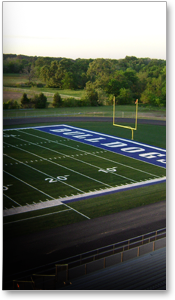 Our synthetic turf is environmentally friendly and highly UV stable. Field repair, field marking, and artwork. Landscape turf for residences or business's. We also offer track striping which comforms to local, state, UIL, and National Federation of State High Schools regulations.